With an African-American sitting atop the GOP polls right now (as well as a sitting African-American president running for reelection next November) the issue of race — and predictable allegation of “playing the race card” — have once again become front and center in the world of opinion media. 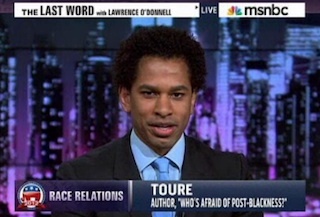 Last night, Touré appeared on MSNBC’s The Last Word with Lawrence O’Donnell, and drew a clear distinction between racism and racial politics, before calling out conservative commentators who have made Herman Cain‘s race — and his treatment by the media — a major issue in the last few days. After playing clips of conservatives Ann Coulter and Rush Limbaugh ostensibly using Cain’s race as an explanation of the recent scrutiny that comes with a candidate at the top of the polls, O’Donnell admitted that he couldn’t make any sense of the “blender of Republican racial politics that’s gotten mixed up together,” and wisely handed off to Touré. The left-of-center author of Who’s Afraid of Post-Blackness made quick work of those on the other side of whatever ideological divide exists between them, by dismissing poorly these thought-out calls of racism which really only serve to muddle the discussion of race to the point where interested individuals suddenly want no part of the discussion. I think that Cain, interestingly, does not exist without Obama preceding him. He rights the ship in a lot of people’s minds or rights the scales. Because Obama is alpha. He is brilliant. He’s a man you had to take seriously. He’s a constitutional law professor that you had to take seriously when he spoke. Cain sort of reasserts the scales the way people want it to be. He’s charismatic and his ideas are not serious or well thought out. There is this constant minstrelsy aspect. He is the one who says he wants the secret service to call him “corn bread.” He says things like oh, “shucky ducky.” This is deep black slang he is using that we have not seen on a national public stage before and in the yellow flower ad that you brought out on your show a few days ago, isn’t he the one that gets punched in his own ad? What sort of man who presents himself as alpha and wanting to be the leader of the free world would get punched in his own campaign ad? It doesn’t make any sense. And yet Cain allows the GOP to have this sort of force we’re not racist we are supporting this black man. even at the same time he admits this myth of black civility and self about negation and you don’t have to take us seriously sort of thing. That Obama threw it out of whack because you had to take him dead seriously. It is quite a provocative notion to suggest that Cain’s certain act of “minstrelsy” as a presidential candidate has only been afforded by Obama’s candidacy before him. While it is not a terribly unreasonable point of view, and it rightly recognizes Obama’s historic campaign that came before him, this sort of analysis ends up defining both candidates in a rather one-dimensional manner, as if the only thing that mattered with Obama and Cain was the color of their skin, cultural upbringing and racial identity. Such is the problem with discussing race and racial politics: there is far more to both candidates Cain and Obama. That is not to suggest that race and racial politics should be ignored, rather, these are hot-button topics that always end up…well, muddling the conversation.